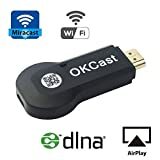 Miracast Dongle, Effortlessly wireless streaming Video, Audio, Game, Picture, App and File in smartphone, tablet or laptop on your big screen HDTV, Projectors and Monitor. Built-in 2.4G Wi-Fi module; support HDMI 1.4; 1080P full HD output offers perfect experience. Miracast HDMI TV Dongle (Multi-screen interactive). Supported Video: H.264 /DivX/ Xvid/ MPEG2/ MPEG4; Supported Audio: MP3/ WMV/ WMA/ AC-3/ LPCM/ AMR/ AAC; Supported Photo: JPG/ JPEG/ PNG/ TIF. Easy to use: No App or drivers required. 3 steps to enjoy media on large screen: Plug->Connect->Mirroring by using Miracast, DLAN and Airplay mode. Good Compatibility: Support Android 4.2.2 and IOS 6.1 above. It can be upgraded online and works well while Andriod, IOS system upgraded. Satisfaction Guarantee: Each product of foxcesd provides a 30 day money back guarantee.We also have an excellent customer service team that can help you make the perfect shopping experience within 24 hours(24 hours a day) (contact us for more information). 1. Support 3 modes: Miracast / DLNA / Airplay. Miracast: Support Android 4.2 or higher. 2. Support online movies/ videos/audio/ TV/ webcast/ web browsing. 3. Mirror whole screen of smart phones, tablets (Photo/video/music/Word Excel PPT PDF/ online TV/internet) to your big HDMI HDTV (up to 1080P). 4. Extreme 2.4 /5G technology, ensuring no delay or buffer. 5. Easy setup: Plug into HDTV and connect to your home WiFi network. No APP needed on your smart phone, tablets, and laptops.No driver needed. Powered by high capacity quality Samsung Lithium-ion battery cells, 500x recharge capacity. Compatible with all smartphone with Micro USB standard charging input. [Use any standard charger with Micro USB cable to charge battery]. Dual USB ports allows simultaneous charging of tablet and smartphone. Compatible with all Android, iOS smartphones, Tablets, iPad, Bluetooth headset, MP3/MP4 and portable speakers. Powerful smart protection function with the over-charger, over- discharger, overload. Short circuit and the lighting protection function. CE Approved and manufactured to quality standards. Intelligent LED status bar will indicate the current battery status. Built-in super bright white LED torch light for night and darkness use. Powered by 6000mAh high capacity Samsung Lithium-ion battery cells. Ex-Pro CHARGEPro 6000mAh Portable Charger is to designed to deliver a portable external power solution for users who always on-the-go. 6000mAh high power capacity and can charge two devices quickly at the same time and provide a total output current 2.1A – Example, Mobile phone & Tablet or 2 phones. Ex-Pro CHARGEPro makes it easy to charge your smartphone and tablet on the go, eliminating the hassle of finding a power outlet or charger. There is a super bright white LED designed to be used for emergency torch light, makes searching for accessories in the dark easy when travelling. Compatible with all Android, iOS smartphones, Tablets, Bluetooth headset, MP3/MP4 and portable speaker. Micro USB input port to allow any Micro USB cable to charge it directly. Elegant shape and fashionable design make it looks more attractive. Powerful smart protection function with the over-charger, over- discharger, overload. Short circuit and the lighting protection function. Intelligent LED status bar will indicate the current battery status. Built-in super bright white LED torch light for night and darkness use.